Investigators continued to search for what caused the crash of a Boeing Co. 737 Max on March 10 in Ethiopia, killing 157 people. A device found in the wreckage provided an early clue and work decoding the black boxes from Ethiopian Airlines Flight 302 began Friday in France. Meanwhile, airlines across the globe struggled to adjust their schedules and assess the financial impact now that the aircraft has been barred from flight. U.S. regulators aren’t expected to lift their grounding order until Boeing completes a software update, which could take at least six weeks. 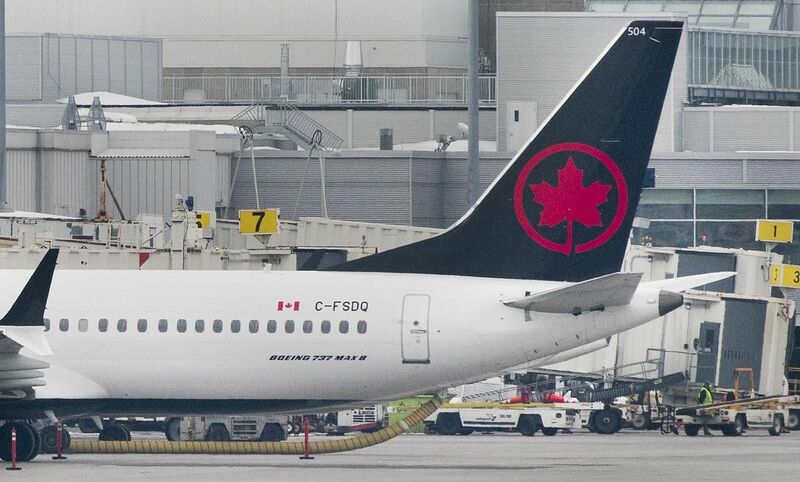 Air Canada suspended its outlook for the first quarter and full year, citing the grounding and Boeing’s suspension of deliveries. The airline’s shares fell 2.3 per cent to $31.16 at 9:37 a.m. The Montreal-based carrier said it is continuing to develop a contingency plan and will provide updates. A jackscrew found in the wreckage of ET302 indicated that the jet was configured to dive, based on a preliminary review, according to a person familiar with the investigation. The evidence helped persuade U.S. regulators to ground the model, the person said. The device is used to set the trim that raises and lowers a plane’s nose. Boeing halted deliveries of the jetliner because of restrictions imposed by the U.S. Federal Aviation Administration. “We continue to build the 737 Max while we’re assessing how the situation — including any potential capacity constraints — will impact our production,” company spokesman Chaz Bickers said. The jets could remain grounded in the U.S. at least through April, lawmakers said after being briefed by aviation regulators. Flights won’t resume until the planes receive updated flight-control software that Boeing and the FAA are racing to finalize, according to two congressmen. That process could take six weeks or more depending on additional training needed for pilots. The first photo of the Ethiopian Airlines flight data recorder showed external damage from the impact of the crash. Technical work on the so-called black boxes will begin March 15, France’s BEA said on Twitter. Average airfares in India soared 65 per cent on major routes after the grounding of the 737 Max, shrinking capacity in the world’s fastest-growing aviation market. Carriers have previously been luring first-time flyers with ultracheap fares. Garuda Indonesia plans to further reduce its orders for 737 Max jets after the crash. The Indonesian flag carrier initially planned to slash its Max orders to 20 planes from 49 outstanding before the October disaster involving Lion Air flight 610. Now the airline plans to cut even more, President Director I Gusti Ngurah Askhara Danadiputra, told reporters in Jakarta. Indonesia will send two officials to Addis Ababa to observe the ET302 investigation, NTSC Chairman Soerjanto Tjahjono said. The agency has received no reports from Indonesian carriers of any malfunctions with Boeing 737 Max jets since the crash of the Lion Air flight in October. Xi Jinping will discuss a major order of Airbus SE planes with his French counterpart, Emmanuel Macron, when the Chinese president visits Paris this month, a French official said Thursday. There are “positive signals” regarding the contract, the official said. Macron and Ethiopian Prime Minister Abiy Ahmed are also discussing a new contract as part of a fleet renewal at Ethiopian Airlines, the official said. U.S. carriers moved swiftly to comply with federal orders grounding their Boeing 737 Max aircraft and shift passengers to other flights. The Max makes up about 3 per cent of the mainline fleets for three U.S. carriers: American Airlines Group Inc., Southwest Airlines Co. and United Continental Holdings Inc.
VietJet Aviation JSC, which doubled an order for the 737 Max to about $25 billion only last month, now said it should decide its plans once the cause of the Ethiopian Airlines accident has been found. Kenya Airways Plc is also reviewing proposals to buy the Max and could switch to Airbus rival A320. Russia’s Utair Aviation PJSC is seeking guarantees before taking delivery of the first of 30 planes. Indonesia’s Lion Air was already looking at scrapping its Boeing deal after October’s crash. Norwegian Air Shuttle ASA, the biggest European operator of the Boeing 737 Max, said it would ask Boeing to cover the costs of the plane’s grounding. DNB analysts estimated a potential cost of between 5 million kroner ($580,000) and 15 million kroner a day for Norwegian.